Dialog Editorial, SFX Editorial, ADR Supervision, ADR Editorial, Foley, 5.1 Final Mixing, MNE preparation, MNE Mixing. Whether you are prepping your project for theatrical presentation or the small screen, SLP delivers the best sounding, A-level results that your project richly deserves. Delivering a hands on approach and an attention to mix detail that is unmatchable in similar sized post budgets. 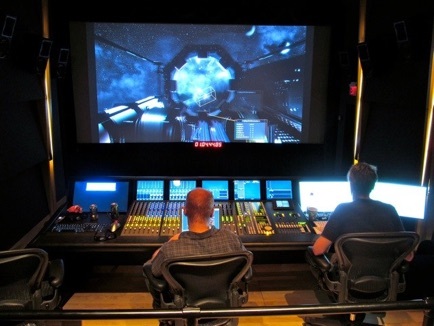 The 19' x 17' mixing facility is located in the Sherman Oaks area of Los Angeles, and features fully automated Pro Tools HDX based 5.1 surround sound mixing. Room calibration and EQ curves adhere to the Dolby specification, so you can be assured that anything you mix at SLP will sound properly balanced on a wide variety of playback systems and formats, from big screen to small. Sound Logic Post is affiliated with Award winning sound effects editors, foley artists, sound designers, and sound supervisors. When you choose Sound Logic Post, only highly experienced, top level audio professionals will be working on your project. As a Composer and Music Producer, Jeremy Grody has scored 5 feature films, 6 shorts, 1 TV series, and written numerous pieces heard on network television and in commercials. In 2006, Jeremy produced a soundtrack for up and coming blues artist, Gary Clark Jr. Interested in Dolby Atmos? Jeremy recently mixed legendary director Douglas Trumbull’s Ufotog using Dolby’s proprietary new surround sound format, Dolby Atmos. If you are planning an Atmos mix and/or wide theatrical release, SLP has the Atmos experience in mind, and can arrange for you to Printmaster your film at a theatrical sized mixing facility.